- Wide-angle and high video resolution:This smart video doorbell adopts full 6G Ultra Wide Angle 1.7mm Lens, 720p HD wide-angle camera provides a clear and complete overview. At the same time, the 170 degrees horizontal PIR motion detection can record any uninvited images and enlarge your curiosity. IR Night Vision-Equipped with infrared lights and IR cut, the camera can automatically switch to black and white night vision view when in the dark to ensure you a crystal view. 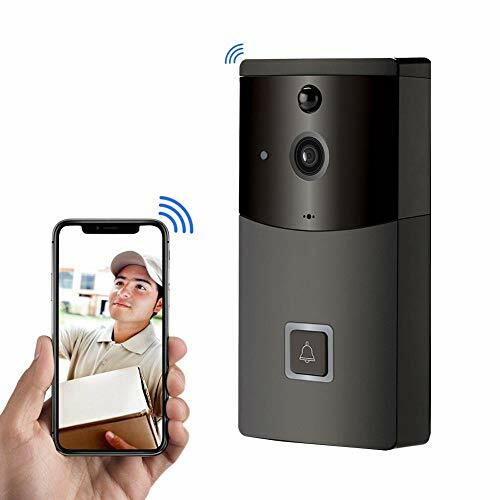 - WIFI Connection: WiFi video doorbell supports the simultaneous management of mobile phones and APPs with bulit-in wifi, reliable links and transmissions, the equipment is also connected smoothly outside the door. Ultra-wide signal reception range ensure the signal could through multiple walls. 2.4GHz Wi-Fi connection - keeping your doorbell always online. - Easily Installation: GAB10 wifi video doorbell needn't wires or cables, what you need to do is downloading the APP, then you can see live videos anywhere and anytime on your mobile phone. you can access to the live video at any time from your cellphone. - Real-time Audio and Video Communications: The GAB10 phone can actively wake up the device remotely and actively monitor the picture you want to see. This GAB10 video doorbell makes it possible to communicate visually with the visiting guests anytime and anywhere, and use two-way speech noise cancellation to make video and sound become more clear and reliable. - Smart Night Vision and Two-way Audio: There is an improved night vision function that allows you to manually switch on the night vision mode based on different light strength to make sure you have one of the best views even in a dim atmosphere. Simultaneous two-way audio allows you to communicate with people at the doorbell end smoothly.